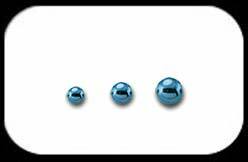 Titanium Ball 1.2mm Blue (pack of 2). Available in 2.5, 3, & 4mm diameter. Grade 23 Titanium.